We are nearing the end of our recent California adventure. The next two blogs don’t have many food-related pictures, because I was too busy talking with my friends to actually devote time to documenting the places we went—that, and I’ve been to most of them a million times during my college years, so I forget that those spots may be new to my readers! 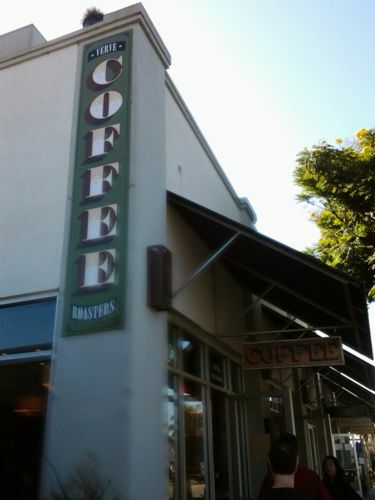 Thursday morning, Ben and I left Los Angeles and drove up the 101 to Santa Cruz, stopping in vain to look for the first coffee shop I’d ever fraternized in my hometown of Santa Maria. Alas, it had been replaced by a Thai restaurant, so I was forced to continue another 30 minutes up the road to San Luis Obispo without caffeine. Why stop in SLO? To see my friend Rachel, a Cal Poly grad student, and my friend, Angie, a Cuesta College employee! We picked up Rachel on campus, and I must say, Cal Poly is situated in a gorgeous setting high up in the hills around SLO. It was also much smaller than I expected. We met Angie for lunch at the Shack, a little hamburger joint on Foothill. The burgers were pretty tasty, and I can’t complain about the giant serving of garlic fries. I loved seeing Rachel and Angie, though I hate that I forgot to take any pictures with them. Boo! But yay to a teeny coffee shop across the street from the Shack called BlackHorse Espresso. It’s apparently the third of a local chain, and their mocha with orange was delicious. After a few more hours driving, and finding myself amazed that even the King City area looked gorgeous after not having driven through it in years, we arrived at my friend Sam’s house in Santa Cruz. Sam and John have a gorgeous home just a couple of blocks from West Cliff, and it’s always wonderful to see them—they rock. We wandered around downtown that night and tried out an ice cream spot that Sam raved about, The Penny Ice Creamery. It was definitely worth her praise, even in a town with Mariann’s ice cream to compete. The Penny is much more of a local ingredient-focused shop with flavors that scream “Foodies, lick this.” I was in love with the balsamic fig scoop I had. When I’m in Santa Cruz, I usually have a few restaurants or cafes that I have to hit up, so Monday morning, it was time for the required breakfast at Café Brasil. Seriously folks, if you’ve been in Santa Cruz and haven’t eaten at Café Brasil—or just Brasil, if you’re a local—you are missing out. They have amazing Brazilian cuisine, and you must try their coffee and juice drinks. I always get the Omelette Brasiliero stuffed with delicious chicken and creamed corn. Like all of Brasil’s offerings, it comes with soft baguette rounds as well. And if I order the same menu item over and over, you know it has to be good. Usually, I have something different every time I go out. After that self-mandated feast, we headed on campus at UC Santa Cruz to hike a bit of the Pogonip trails. 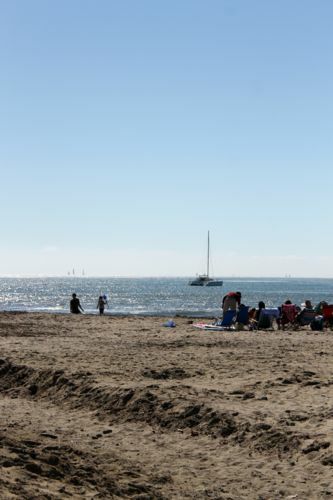 My college is surrounded by hiking trails, and Pogonip on the east side provides beautiful hilly walks through the redwoods and unexpected meadows with views of the boardwalk and the coast from afar. 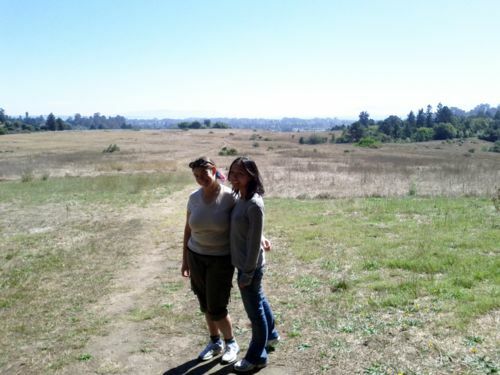 Here are Sam and I; Santa Cruz is sprawling just beyond the meadow. I love that town. After letting Sam recover from the hike (I really do wear people out), we went to pick up my friend Devon and spent the rest of the afternoon just hanging around downtown. I demanded coffee at Caffe Pergolesi, my favorite coffeehouse ever for its great drinks and the metal vibe that comes from a lovely Victorian being covered with crazy murals and artwork, students crammed into every corner of the house, and the lovely, lovely deck that surrounds the house. Basically, it makes me think I’m a badass when I’m chilling there. Fun fact: The “Dr. Miller” lettering painted on the side of the house comes from the original owner, Dr. Miller, who used the place as his home and dentistry in the late 1800s/early 1900s. For dinner that evening, we tried a newer Santa Cruz restaurant in another old Victorian called 515. Lo and behold, it was also Dine Out Santa Cruz week, but I managed to forgo the tasting menu, opting for a cheese plate and a vegetarian pasta dish instead. Disregarding the fact that I think using your address as your restaurant name is thoroughly unimaginative, 515 was a great choice for a cozy, upscale, and relaxed feel in Santa Cruz, and there aren’t a lot of options for that in our hippie town. Their cocktail list was fantastic, and I definitely enjoyed the Phoenix, subtitled “Scott Summers is a tool,” that was made from gin infused with earl grey tea, a black pepper simple syrup, lemon juice, and egg whites. We then stopped by Trader Joe’s to get some wine with the mission of getting Devon drunk, and called it a night. And what a lovely day it had been. The next one was just as lovely. 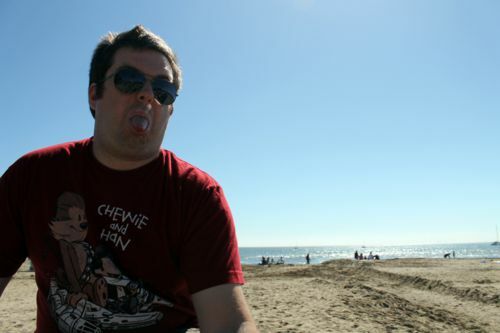 We headed out to Capitola so I could 1. Try out a coffeehouse recommended by one of my Durham tweeps, and 2. Spend the afternoon walking the streets of Capitola Village, which is my favorite locale on the north side of the Monterey Bay. 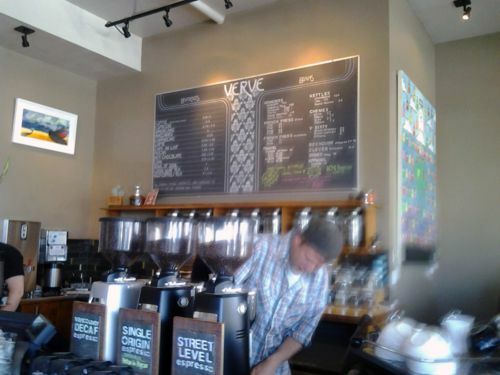 The coffeehouse is called Verve Coffee Roasters, and it’s doing very nicely in the Santa Cruz area, now with three locations. This is their original locale on 41st Ave.
Just down the street, we got breakfast from the Chill Out Café, a little shack with a patio out back that specializes in gigantic breakfast burritos. It’s been a favorite of locals for years, but I’d never eaten there before. Portions are huge, and if a customer shows up with a kitten on a leash as happened when we were there, then all the better. 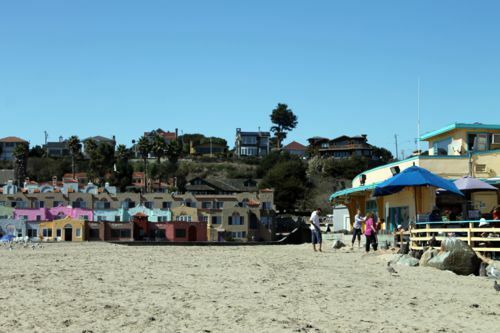 Capitola Village, if you haven’t been, is composed of short blocks of shops and restaurants with all roads leading to the gorgeous beach. A lot of the shops are quite unique, so it makes for a nice day of gawking. 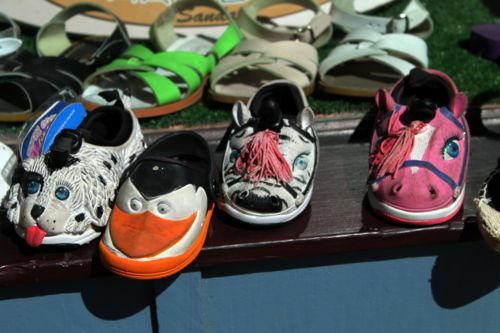 Fun kid shoes on display. 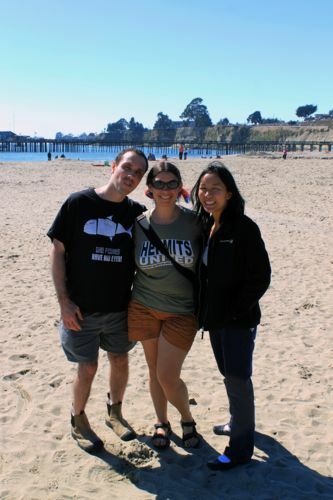 Devon, Sam, and I on the beach. The Capitola Venetian Hotel, a big part of what makes Capitola such an attractive town. 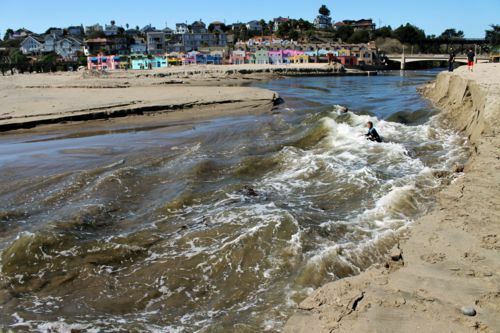 The stream the runs behind the main Capitola strip was churning with water this time! Ben’s never quite as enthused as I am. 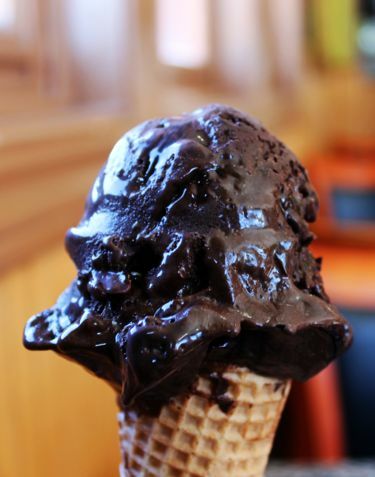 Mariann’s ice cream is available at Capitola Village now, in one of the little cafes on a corner. Not planning to stop by their main store on this trip, I couldn’t pass by the opportunity to have more ice cream. I went for a triple chocolate masterpiece that was worth every calorie-filled bite. Oh yes, you know you’re jealous now. 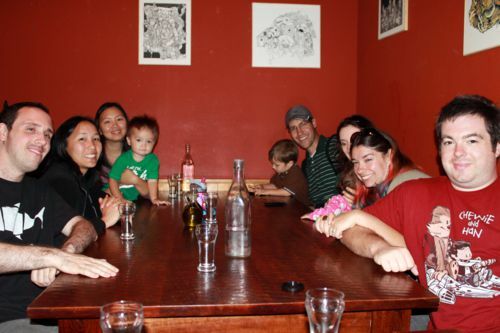 Eventually, we made our way back to downtown Santa Cruz and met up for dinner at 99 Bottles with a few of my nearest and dearest and their little ones. 99 Bottles is a favorite downtown because of their large beer selection—the food is pretty good, but I’m never quite as enthused with it as my friends are. The waffle fries are great, and there are plenty of burger and sandwich options worth your while. I am, however, incredibly enthused with Chocolate, a restaurant out in front of the Bookshop Santa Cruz. Their dinner menu is great, but the real draw is the amazing variety of hot chocolates and delicious desserts. Each hot chocolate comes with fantastic and huge ladyfingers. Try the Fuego with dark chocolate, cinnamon, and chipotle peppers or have the Titanic, a scoop of gelato floating in a sea of espresso. All my lovelies gathered together at Chocolate, except Paul, who’s behind the camera. Thus endeth my first two days in Santa Cruz. 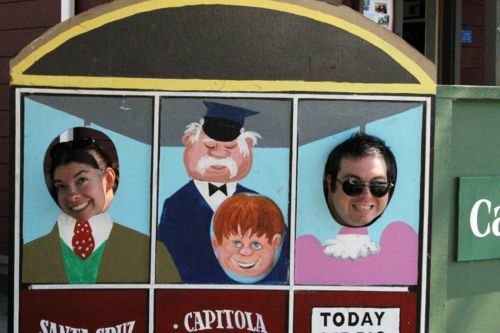 There’s only one more blog post to come, full of Santa Cruz pier and boardwalk photos. In the meantime, if you’d like to peruse more pictures of our trip, head on over to our photo site.